Admittedly not a restaurant, or a cafe, but the Alma Supper Club has a very well deserved place in Greenwich. So when we were invited by Jose and Anne-Claire, we were truly excited. Alma is a supper club, based in Trafalgar Cafe and runs usually once a month. It’s a seven course, tasting menu based on Jose’s and Anne-Claire’s travels and Jose’s experience as a chef. A fusion menu that marries successfully different parts of the world in one delicious plate. And you get to taste seven of them. It is hosted in Trafalgar Cafe, which we found to be a wonderful venue, with minimal and clean lines, that truly suits the Alma experience. 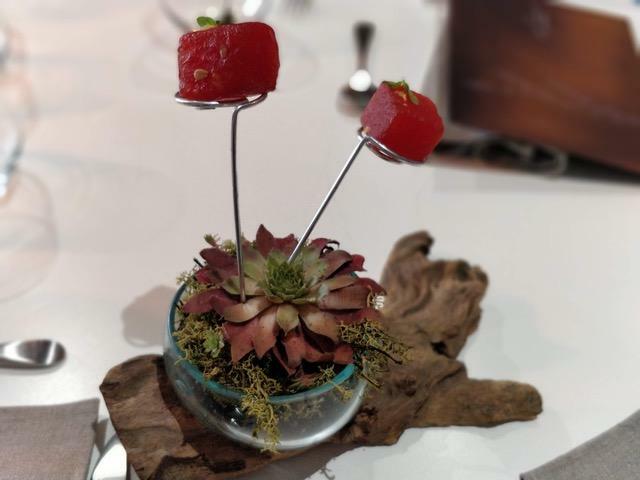 We were greeted with a refreshing amuse bouche of sangria marinated watermelon. That little juicy square, set off the meal beautifully. Cool yet with a nice punch from the sangria. 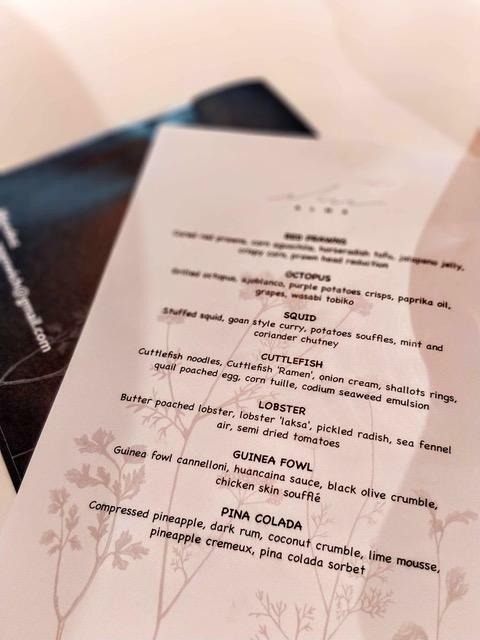 Anne-Claire explained the concept behind Alma so eloquently and we could see it has been created with a lot of love and knowledge behind the food they were about to serve. The dishes arrived one after the other and all of them impressed us with presentation and unique flavours. Jose mixed ingredients from different countries and expertly constructed little plates that seemed to come out of a Michelin starred kitchen. Cured red prawns with corn aquachile, horseradish tofu, jalapeño jelly and crispy corn. A dish that personally I found more acidic than I would have liked, yet with interesting and new flavours to me. Fresh and clean flavours nonetheless. 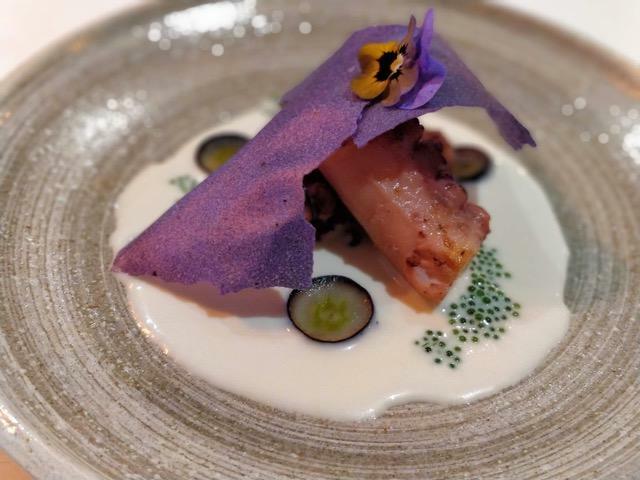 Octopus in ajoblanco, purple potato crisps, grapes and wasabi tobiko. 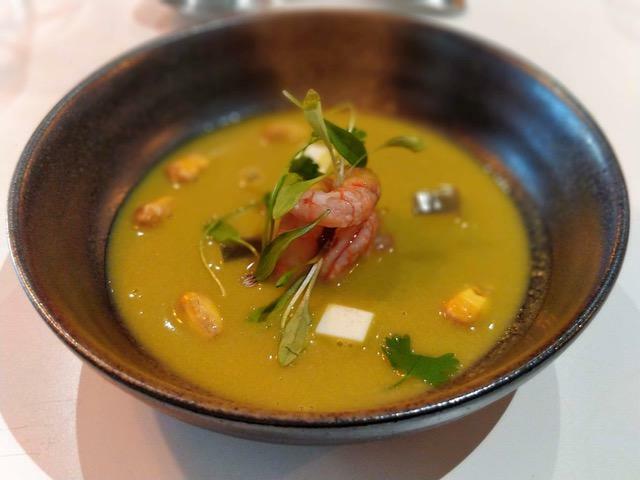 A dish that grabs the Med and swirls it with a bit of the Far East. It came under a glass cloche filled with smoke and what an entry that was!! The octopus was pure perfection, held its shape and yet it was soft like a pillow. The purple potato crisp was not just pretty but unexpected too colourwise, showing Jose’s cooking techniques beautifully. The ajoblanco was exceptional too. Stuffed squid in a Goan style curry, with potato souffles and a mint and coriander chutney. Another seafood dish cooked incredibly well. 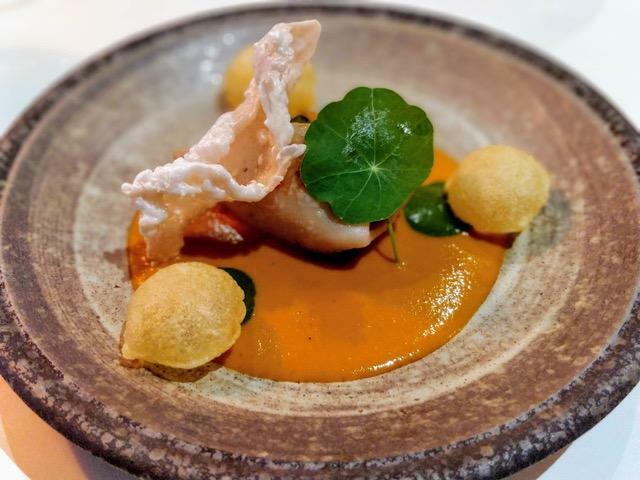 The squid was stuffed with chopped pieces of squid (tentacles and body) presented on the mouthwatering Goan curry and topped with a crispy prawn cracker. The potato souffles reminded me of tiny poppadoms and they were totally appropriate for this phenomenal dish. Cuttlefish noodles, in cuttlefish ramen, onion cream, shallots crisps, quail egg and corn tuille. What a genius dish! The cuttlefish was cut into string that represented noodles. And it was like eating seafood noodles indeed! Wonderful balance of textures and so many different cooking techniques in one plate. Butter poached lobster in a Laksa sauce, confit semi dried tomatoes, pickled radish and sea fennel emulsion. 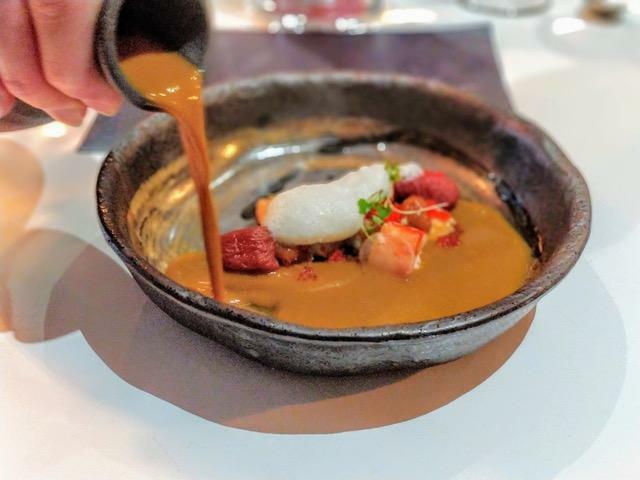 Tender pieces of lobster in a laksa sauce topped with the sea fennel foam. Although I found it similar to the squid in Goan curry, the sweetness of the tomatoes and the crispy radish made it a dish to carry its own place in the menu. As with the previous dishes, the presentation again was faultless and picture perfect. 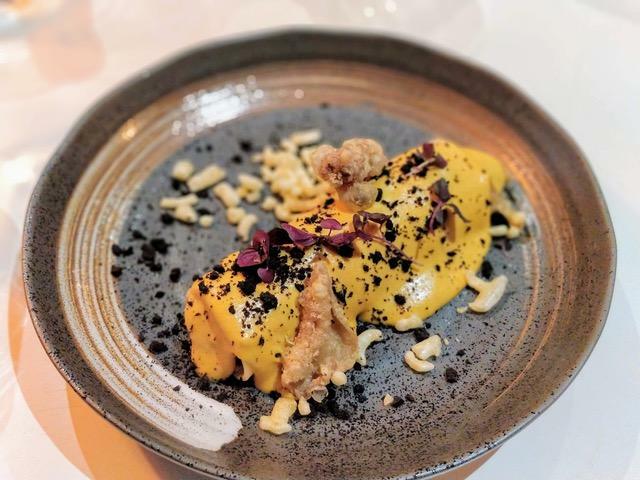 Guinea fowl cannelloni, huancaina sauce, black olive crumble and crispy chicken skin. 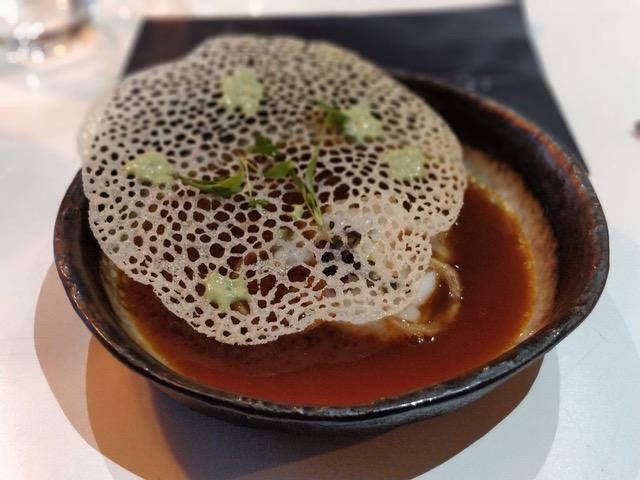 By the time we received this dish we were truly full, full of beautiful flavoursome food! But this Peruvian and Italian marriage couldn’t be missed. The sauce draped the cannelloni and added another level of comfort to the soft and creamy stuffing. The crispy skin added the right balance in texture too. 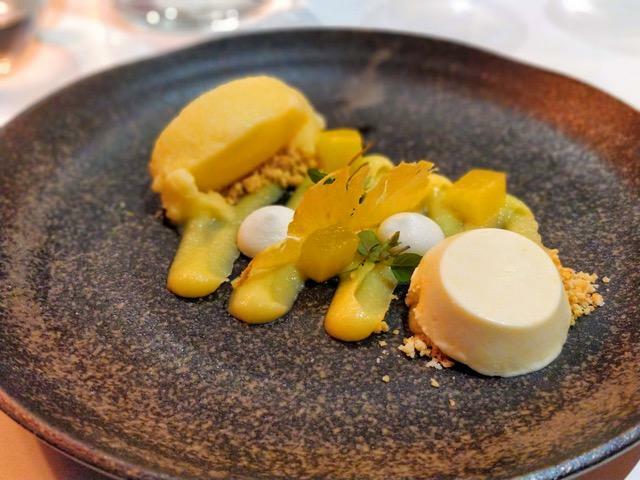 Lime mousse, pineapple creme, Pina colada sorbet with compressed pineapple, dark rum and coconut crumble. The ending of such an amazing dinner should sing! And this dessert not only sang but danced in our mouths too! Its was magnificent! Again the refreshing flavours, the texture and the presentation were on point. It was like having the best Pina colada you ever had, on a plate and more. We loved it so much that we were tempted to ask for a second serving. Jose’s cooking is out of a Michelin star kitchen, yet it’s produced in a small cafe kitchen and that on its own is highly commendable. He loves food, he loves to entertain your senses and has the knowledge to produce something extraordinary. If there is one thing to do on the internet is follow Alma on Instagram (@almagreenwich) and book their next supper club. Haute cuisine with punchy fusion has landed in Greenwich and it’s not to be missed!! Disclaimer: We were guests of Alma, but my comments remain completely honest and my own, based on our dining experience.